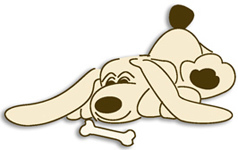 Hi, I’m Jan Westby and I’ve been running Best Friends Pet Dog Training since 1990. 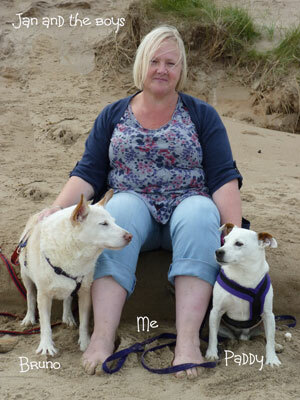 I live in Bradford with my two rescue dogs, Bruno and Paddy, who are 13 and 12 years old respectively and were both cruelty cases who came to me from the RSPCA aged 1 year and 3 years. I teach owners throughout Yorkshire how to teach their dogs to be sociable, happy, well-controlled family pets and also how to change unwanted behaviours using kind, fair, fun, highly effective methods based on sound science, understanding and communication rather than out-dated ideas based on so-called ‘dominance’, coercion and fear. I’m a founder member of and assessor for the Association of Pet Dog Trainers and have a Diploma in Companion Animal Behaviour and Training from the Centre of Applied Pet Ethology. I’m also a member of the COAPE Association of Pet Behaviourists and Trainers and have a Certificate for Teachers and Trainers of Adults. Over the years I have attended hundreds of hours of courses, lectures, seminars, workshops and study days with some of the profession’s most knowledgeable and respected teachers and practitioners. I run small, friendly classes in Saltaire and Bradford and also do home visits for 1-1 training or working with behaviour problems ranging from house-soiling to reactivity and aggression. Believing firmly in positive, kind training, I’m a founder member of the Association of Pet Dog Trainers and have a Diploma in Companion Animal Behaviour and Training from the Centre of Applied Pet Ethology. I’m also a member of the COAPE Association of Pet Behaviourists and Trainers, a Registered Animal Training Instructor with the Animal Behaviour and Training Council and I hold a Certificate for Teachers and Trainers of Adults. I also worked for several years as the external training and behaviour consultant for the then Leeds and Wakefield branch of the RSPCA, and Dogs Trust Leeds, working with staff and dogs both in-branch and with adopted dogs and their new owners to manage training and behaviour problems that can sometimes arise after adoption. Classes for reactive dogs will be available very soon and seminars, talks, lectures and workshops on all aspects of living with and training your dog will also be offered at intervals throughout the year. All this means that I’m passionate about helping you and your dog have the best relationship you can possibly have right from day one, and if something has gone a bit off track for some reason, helping you get back on track so that you definitely are Best Friends. And there’s a fully functioning web-site coming soon! You’ll be able to access information on all the services I offer, including prices, plus details of the content and availablility of all my classes. You’ll also be able to book classes and pay online, as well as have access to articles on living with and training your dog. And much more! Website by Spacecake Web Designer Bradford.